It was my mother-in-law's birthday on Sunday. I know that she loves coconut, so I made this Vanilla and Coconut Cake, a recipe by Lynn Hill, from the Clandestine Cake Club Cookbook. 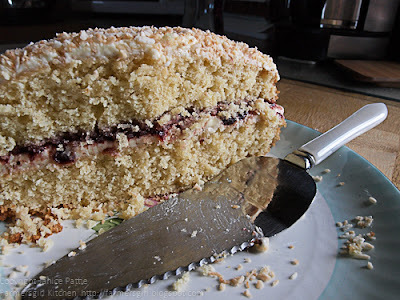 I reviewed The Clandestine Cake Club Cookbook in February and didn't even mention this cake! 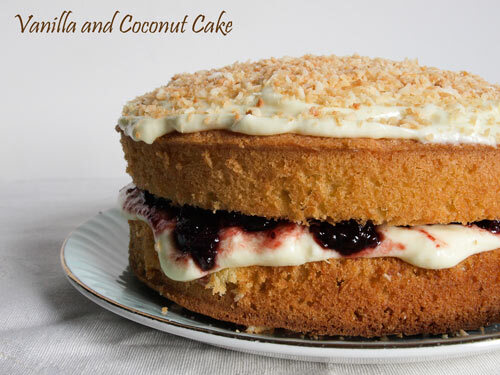 However, a quick search through the index for coconut and I came upon this simple but effective cake. I can't print the recipe as it is copyright, but it's a butter sponge with added desiccated coconut and vanilla extract. Filled with a layer of jam and vanilla buttercream, with some more buttercream on the top and finally sprinkled with toasted coconut. It was totally delicious and went down well with the oldest: mother-in-law to youngest: our 2 year old grandson. 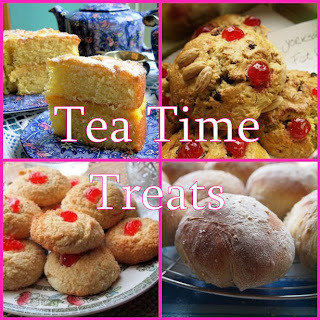 Over at Tea Time Treats, the blog event run by Karen at Lavender and Lovage and Kate at What Kate Baked, Kate is hosting this month and has picked 'Layer Cakes' as the theme. I know I should probably try harder and go for multi-layers but two layers is allowed and as I am desperate to share this cake with you, this seems like the perfect opportunity! I've no doubt it was a huge hit at the birthday and I'm sure you'll be baking this beauty over and over again- thank you for entering it into TTT!